Well, we're on the ultimate BMX Mom Adventure. The boys were deposited today at Ohio Dreams Action Sports Camp, where they will learn the skills they need to win win win!! OK, whatever. "Are you ok?" I asked Vann, as we walked briskly to the car. It was an odd feeling-- leaving our babies at this bizarre place to fend for themselves. I did get to make their beds though, and it comforted me to know that their corners would be properly tucked. We know that they are in good hands. The coaches are patient and kind, and truly love what they do. 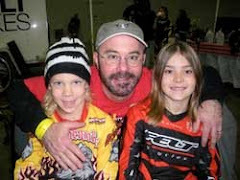 We lingered as long as we could, watching the boys enjoy the indoor skate and freestyle bmx complex. Wyatt's face was lit up- "It's fun to fall Mommy! It doesn't hurt!" He was riding his scooter amongst the freestyle bmxers, having the time of his life. We're a 15 hour drive from home, and will retrieve our hopefully unbroken boys in 6 days time. So, we've decided to stay four miles away in the Mohican Lodge. This has turned out to be part disco, part paradise. Although dated and groovy, it's a quite lovely place. Vann and I have plans to hike, canoe, and hob nob with the local Amish. There's a lovely lake here that is not visible from our room, but Vann's keen eye detected a spotted fawn this evening from our little balcony. Camp really is a good thing.